How can I learn style? 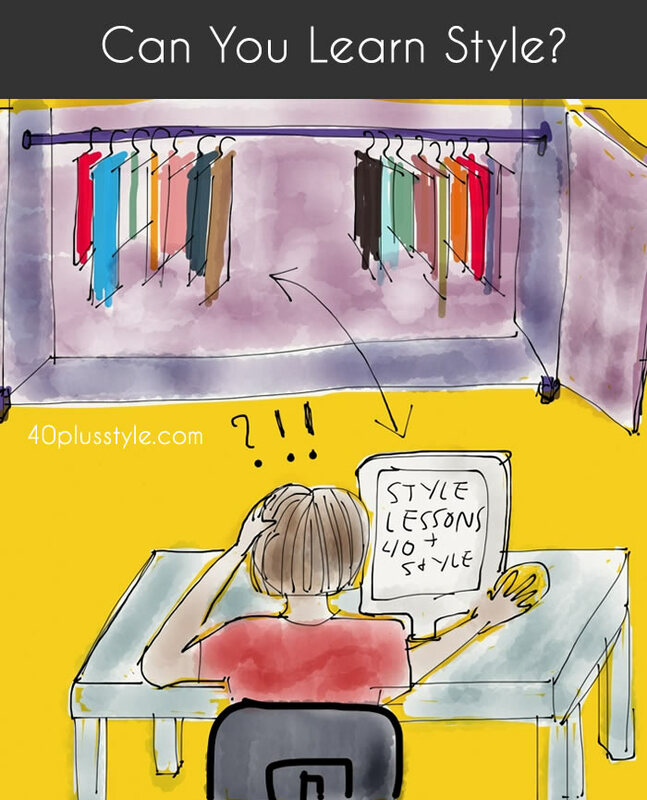 40+ Style » Finding your style » Can you learn style? You often hear that you cannot learn style. We are all naturally good at something. You may be very creative, very good with numbers, can photograph really well, are the best cook etc. Therefore, it is also true that some people are naturally very stylish. They are born with knowing how to combine clothes, how to create balance and how to create looks that are cohesive, effortless and chic. Most of us will not be born with this skill. That does not mean that we cannot have lots of style! It just means we have to work a little bit harder at it. Just like with any other skill that you may not be naturally good at, but like to learn, practice makes perfect. If I want to learn how to play the piano, I will have to practice every single day to become very good at it. In order to become a better writer, I have to write every single day. One of my favorite writers, Malcolm Gladwell, actually wrote a book about this: Outliers: the story of success (By the way you should really read all his books David & Goliath, The Tipping Point and Blink; they are so good). His research showed that a lot of the most talented and successful people in their field like Bill Gates actually spent years and years practicing their skills. He actually points out that one of the reasons Bill Gates became so good at what he did is because of a combination of luck (long hours of access to a good computer which was rare at that time) and the total (very large) number of hours he spent learning his craft. He asserts that in order to become really good at something most people will need to practice for at least 10,000 hours! When you take that principle back to style, you can understand why one of the slogans of this site is “Because style only gets better with age”. We dress and style ourselves (practice) every single day, so naturally we get better at it. But what if there are times that we don’t really practice it? This could be because we are either too busy to put much thought into it or because we feel so bad about our body that we have given up hope of looking stylish altogether. We may just grab the first thing we see. All of a sudden, you start putting on the same old things and don’t really practice the art of style anymore. Some of us have also never received proper training on how to dress ourselves. If you did not have a good role model while growing up, never learned about the importance of balance, structure and flow in an outfit or never read a fashion magazine that advises on style, then it’s hard to get really good at dressing yourself. Just like it would be hard to become a good piano player if you never had a good teacher. Through doing my style challenges and my style course, I KNOW that style can be learned. Women in the course tell me that all of sudden a few light bulbs went off and they are suddenly starting to realize why some outfits don’t look good on them. They realize that when they start practicing and playing more with the clothes in their closet that they can create final outfits that look amazing. They are starting to understand their style personality and their bodies and what works for them. “I am, at last (has only taken 46 years) starting to really understand what suits me and what is my style. Although we are only a short way into the course it has been tremendously helpful thus far. Learning a few ‘tricks’ and understanding your style, you body, wardrobe balance and how clothing and grooming can work to enhance your style can make a HUGE difference. Especially, when those women start practicing a lot and start working toward those 10,000 hours. That is one reason why I like doing my style course. It is a lot of work but I know it can make a real difference to someone’s life. I have seen the difference it can make to how someone feels. Feeling better about yourself and the way you look, can change your life. I KNOW that style can be learned! If you are willing to make a change and start exploring how you can improve and ignite your own style, then you can do it too! My style course, 21 Steps to a More Stylish You is a very good starting point. Get more details and enroll. Do you believe that style can be learned? although i´m the in the camp “being born with style” i really appreciate your efforts to help the ladies developing their own style. we all have to get dressed – so why not use it to feel better in the end of the day?! life is hard enough. so let us pamper our souls with clothes we feel awesome in! I truly believe so Beate! Oh how lovely. Enjoy! I had a few lessons when I was a student and wanted to be a singer when I grow up! I agree it is something that can be learned — I certainly have come a long way. I do think there are things that people are born to it will always do better than those of us who have had to learn it. It’s really hard for me to style vintage clothes or a truly new trendy look, mostly because you need a lot of confidence to pull some of this off. Since it’s not natural for me I can’t reach this level of confidence. You have certainly helped me these last few years. I am glad there are those who are being helped by this style course. Thanks Lisa. I agree that you may not be able to become the next style icon, but then there are only a few of those…. I definitely agree (and am happily participating in the 21 Steps to Style Course!) I grew up having little in the way of nice clothes until after college when I worked full time. Styling clothing and paying attention to my appearance does not come naturally to me so I really have to concentrate on it. I am still learning and interested even at 60+. In fact, I am probably more focused on it now. And you certainly are never too old to learn something new. In fact I think you stay younger for longer when you consistently learn something new! I’ve learned a lot from following you Sylvia over the past 3 or so years, so thank you very much for that! 😀 However, while I can admire serious style, including eccentric style, on someone else, my biggest “challenge” for me, is not wanting to draw attention to myself, say with amazing sandals, or an amazing necklace, even tho’ I love that kind of stuff on other women. I wear mostly black, nearly every day, because it’s easy, it’s slimming, and it doesn’t really draw attention to me. I’d love to hear more from others who have the same predicament. We’re all so different aren’t we? Definitely we are different. I love color. I would say my style is pretty traditional in terms of cut of clothes, but colorful combinations. I think color just makes me happy. I don’t think I scream “pay attention to me” but I don’t mind some attention. I like seeing a woman in lovely bright colours – makes me happy too! Probably it’s just a confidence thing with me in that I don’t want people looking too close because they’ll see the imperfections. I’m not vain, far from it actually. Just don’t want to be judged :-/ in case what I’m wearing is wrong or “mutton dressed as lamb”!! That “judgement” would be expression of the other person’s view right? I totally sympathize with both of your perspectives and feel every women should wear what she feels comfortable with. I mean, I know what kind of a person I am and if all black suits me and my personality, fine. But if going crazy on the colors 🙂 that would be my choice as well and nobody else’s business I think. Based on that there are a view items I find find difficult to wear being less on the subte side which I prefer in a way such as leo prints and leather leggings. love leggings though. Just does not do the trick for me. An attention highlight here and there is more to my liking. So to make a long story short, yes Sylvia, I agree with you, style can be learnt: trusting your OWN judgement,not blindly following trends etc. For this it takes “studying” like Miuccia Prada recently said in an interview. That was her advice. Yes Sabina. I totally agree. It’s very personal. That is why in my style course I don’t tell people what to wear. I give them ideas, a few ‘tricks’, guidelines but each woman has to identify her own unique style and what makes her happy! No matter what you are wearing Petra, people will judge you. It sounds harsh but I think it’s true. You can NEVER please everyone with what you are wearing, so you must please yourself. Perhaps, if you like to add some more color, take baby steps. Add a subtle colorful accessory for example…. yes we are all different and style is unique to you. If you feel happy wearing black then go for it! Serious style does not have to be either eccentric or colorful. I agree with you that we all can learn to dress better (flattering our body). I have been shopping since I was 17 but I never had a good idea what looked good on me, hues/tones, proportion, accessorizing, etc.. I guess I had never taken a good at myself in the mirror for the past 3 decades. The wake up call came 3 years ago. I realized that I knew nothing about dressing myself, just blindly following trends and what’s the cheapest items I could find in stores. I started my education by getting style how to books from library, browsing fashion bloggers, checking out street style photos. Once I built up a good size data in my mind, I started to dress better and buy better. I got rid of the habit of making price a priority. Now I pay more for items but I buy smarter and less. It actually saves me money over all. By end of 2013 I decided to document my outfits to shop my closet (I banned shopping in 2014 for a whole year). Although I had no idea how to dress my body for decades, I did amass many lucky finds (the time I spent shopping, I was bound to find great items at deep discount). With over 300 outfits now, I can look back and see progress in how I dress, not to mention keeping the weight off from the photo monitoring. Here’a my blog and anyone can see for herself that someone who is not naturally in tune with style can learn. I will never be a style maven or a trail blazer but I have found my own little comfort zone. Isn’t this the reason why we pin pictures and have fav instagram follows, learning to dress ourselves better? You look amazing 33 and what dedication to keep a record of all your outfits! Keeping track of my outfits, I have my trusted tripod and remote control to thank. There are not many variations in my photos but my goal is to document. Without another person taking my photos, it’s hard to be artsy about photos. Some high profile bloggers started blogging by posting photos they took of themselves in the mirrors (Carrie of Wish Wish Wish is one). I am very lazy by nature. The only way I will spend a lot of time on something, is when I am passionate about it. Fortunately I am passionate about dressing, so I am trying to style better. No an easy task. You are absolutely right, Sylvia. You are an outstanding guide for people looking to find ways to express themselves well through their style. You don’t push, you are open-minded and encouraging, educated in the field, and a great role model. I struggle when I learn a new thing and I want to be a master at it right away, but I know that practice always gets me closer to my goals. You helped me a lot too! Thank you for being the force behind me. that’s such a great link. 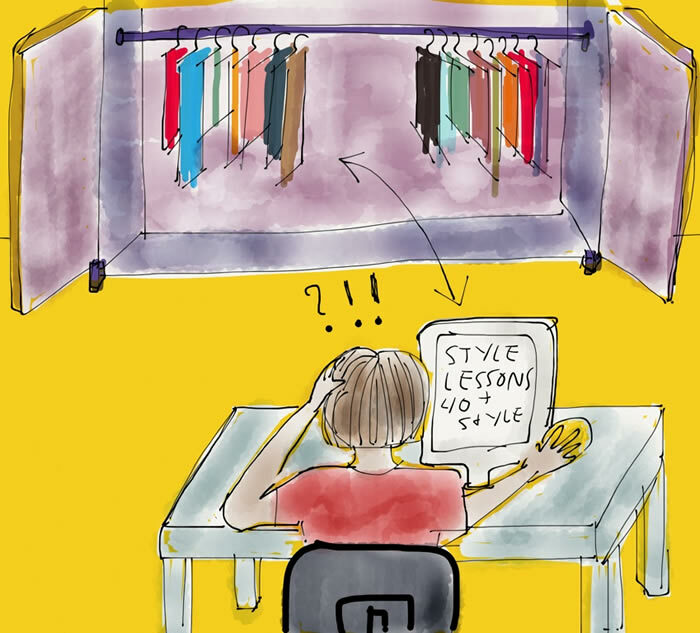 Next post: How to get out of a style rut?